The small gravel garden emerged from the drive - after all, if weeds grow in the drive, why not grow plants I want? The bed has just "grown like Topsy" and now it blocks the entrance to the garage. This creation was inspired by the writings of Beth Chatto, who made her magnificent gravel garden on the site of the car park. The well-drained West-facing bed, a mere 8 foot x 11 foot, enables me to grow plants that would not thrive in the claggy clay elsewhere in the garden. These include creeping blue-grey leaved Acaena buchanii (New Zealand burr), delicate white bells of Acis autumnalis (increasing very slowly), the Nodding onion, Allium cernuum (both white and purple), Anemone pavonina(pink, red and cream), Anemone rivularis (arrived by accident- it is somewhat surprising it is happy in this relatively dry bed), Briza media (Quaking grass), the narrow spiky orange leaves of Libertia perigrinans (New Zealand Iris), Osteospermum jucundum (African daisy), Salvia officinalis "Tricolor", the Skullcap, Scutellaria suffrutescens 'Texas Rose' and members of the Iris family such as Iris pallida 'Argentea Variegata'. 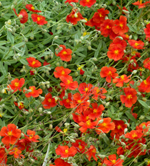 Helianthemums (Rock roses) in reds and yellows, provide a burst of colour. 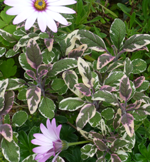 In autumn 2013, I noticed a pair of grey-green, elliptical leaves emerging from the gravel. 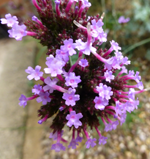 I left them as I did not recognise the plant and they looked 'promising'. 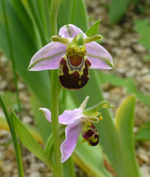 To my great delight, I found I had acquired a Bee Orchid (Ophrys apifera), which flowered in June 2014 and set seed. The plant died and I may have to wait another 6-8 years before I know if I have another one. Top tip - don't weed too diligently. You never quite know what hidden treasures your garden holds!